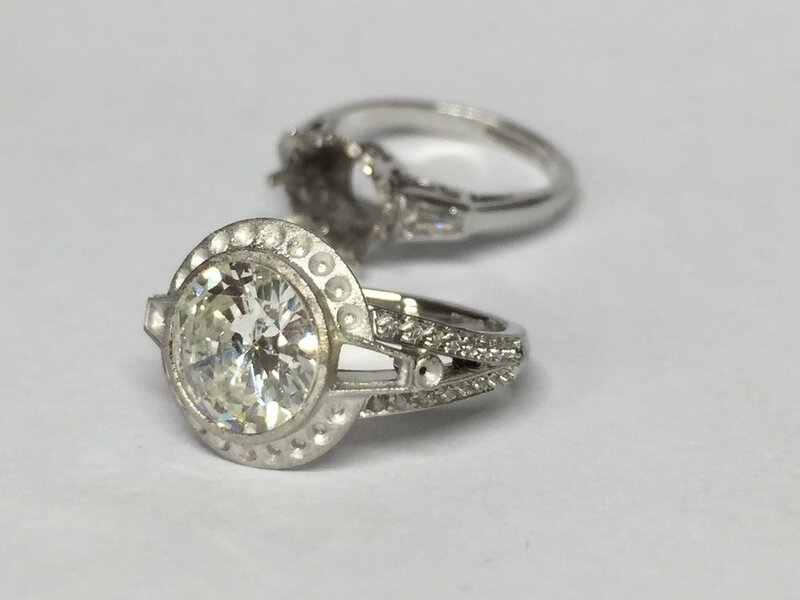 All manner of repair work is carried out here in our workshops, from simple ring sizing and chain soldering, to complex re-tipping and re-mounting work - no job is too big or too small. With our workshop on-site we are able to offer direct advice from our goldsmiths, reducing the amount of time you are without your jewellery. With our goldsmiths situated on the shop floor, you are able to have an in-person conversation regarding your repair, how the work will be carried out and a guide on the time frame. We can size 9,14,18, and 22ct Yellow, Rose and White Gold rings as well as Platinum and Palladium. Depending on metal type and carat purity prices start at £50. Work is carried out in-house with items covered by our insurance whilst in our care. We aim to size 90% of rings purchased from us within 3 hours on the same day of purchase, depending on the complexity of the job. This is one of the many advantages of having our workshops and goldsmiths on-site. Bracelets or Necklaces wear overtime, especially if worn frequently. Should your chain break, or clasp fail, we are able to repair this for you with prices starting at £25. Level 1 - Stone Check, Ultrasonic, Steam Clean. £10 per item. Level 2 - Stone Check, Ultrasonic, Steam Clean, Heavy Polish. £25 per item. Level 3 - Stone Check, Ultrasonic, Steam Clean, Heavy Polish, Rhodium Plating. £35 per item. Although we do not have a hand-engraver on our premises we outsource our hand-engraving requirements to a highly reputable engraver. With a variety of fonts to choose from they are priced per-letter, plus postage, suitable for signet rings, pendants and so on. Hand engraving is deeper than standard machine engraving so will last far longer. This ring was cast with the eagle added by our cad designers, no hand carving required on this one! Having our workshop on-site and casting house locally, we pride ourselves on being able to offer a bespoke service from start to finish. There is no exception to our re-mounting service especially for those highly sentimental pieces that have been worn out. Some designs however, can be very difficult and so may be prohibitive although a quote will always be given. Whether it is an inherited item or simply a piece that has been worn for years and years, there may come a time when your precious stones will need remounting and this is where our team can help. If this is the case then our cad designers can step in to help. 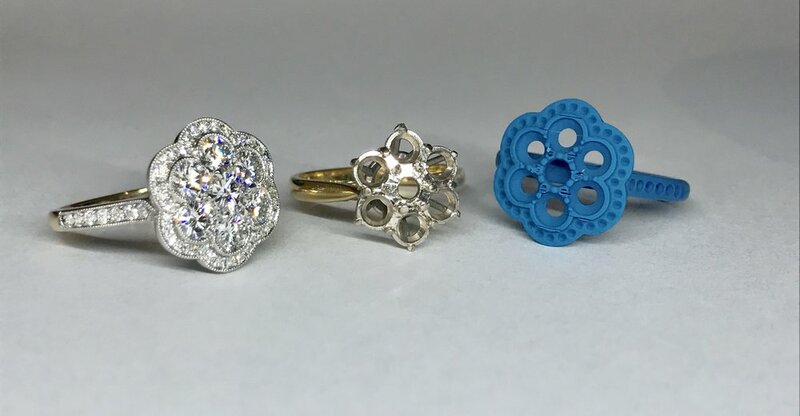 We are able to 3D scan your original mount, import this to our CAD software and begin rebuilding a new ring mount whilst restoring the areas that had worn out. Previously this amount of accuracy and the ability to copy every element of the original design, was something that wouldn’t have been possible. In the past, jewellers could only choose from a pre-made library of patterns that were available and would cobble together these components to try to get as close as they could to the original. Hand-making was of course possible for some designs but would generally be much more expensive. With our 3D scanner, and CAD software, and a skilled workshop to add the traditional touches, we can ensure an exact replica of your much loved piece and which will give it a brand new life. Our soldering/laser welding services can help fix all manner of jewellery repairs. With both the traditional soldering and more recent laser welding option we are able to repair far more items than before. Minimum price on any works carried out starts at £25. Soldering includes work such as attaching charms to bracelets and joining jump rings attached to pendants/clasps etc. Our seal-engraving is outsourced with the capacity to have your family crest, motto or coat of arms , engraved onto a signet ring of your choice. Pricing for the engraving begins at £275 for a simple crest. This is additional to the price/purchase of signet ring. 9ct Yellow Gold Signet Ring. Wax impression of the engraved signet ring. A new mount, partially set, for our customers inherited stone. We have two very highly skilled stone setters whose work defines the very best of Timothy Roe diamond jewellery. Their work is all carried out under microscopes due to the minute tolerances needed with fine quality jewellery. When you look at the examples of their work you can appreciate the time and care they put into every piece they work on. Having our stone setters on site and as manufacturers of fine jewellery, we are able to keep a supply of most precious gemstones in-house, again reducing the time you are without your jewellery. Our stone setters expertise means that, like our goldsmiths, they are able to offer first hand advice on your item along with a faster turn-around on re-setting missing stones. Below we have a few examples of some of the setting work that goes on everyday in our Chichester setters workshop. One of our stone setters working on a bespoke commission. Stone setting clip: “hammering” down the edge around the channel set princess cut diamonds. Click here for full video.